I've never been to Legoland, but on a trip to Orlando my family ended up walking through the Downtown Disney area, which is along some sort of bay. It's a strip of shops, food places, and entertainment, but there is a Lego store and around the store are Lego statues. My favorite was a sea dragon that was built as if rising out of the water. Yes, very cool, though too many Bionicles or whatever they're called last time I was there. Here's a shot in the dark. Any of you guys experienced how annoying it was if you attached one of the "flat" pieces to a landscape board? I broke many nails trying to peel the flats 2s out. Just thinking about it makes me squirm. Definitely. I wasn't a fan of having to pry those apart. There were countless times where I gave myself a cut from all the attempts. Needle nose pliers were the key. There's a LEGO store at the Mall of America, which is less than 15 minutes from my house. It's pretty much the only reason to go to MOA. Sadly, when I last moved, I foolishly disassembled and mixed the pieces, so I'm very slowly managing to re-sort my collection. On the plus side, I don't feel constrained about building random stuff with mixed pieces, seeing as they're already unsorted. On the minus side, there are pieces I know I have that I just can't find, because they're mixed in with 15,000 other pieces right now. Oh, and I have a first-generation Mindstorms (1.5) kit. One of the best things about the kit is that it came with a brick-separator tool. Actually, if you have a local Lego store, you can buy the separator tool there as well. I would just flex the landscape board a little and that would usually create enough gap for a finger nail, but yes it was a pain. Those brick separators were the best for getting flat pieces apart... great invention! Awesome moon landscape piece, weird slanty windows, and crazy sliding rocket chair things. It doesn't make a lot of sense, but it was the first big set I ever got. Yeah, I never had one of those moon landscape pieces. I thought they were cool, but then again as a kid you generally think what you don't have is cool. Agreed. That seems to be one of the themes of this thread. The more recent models are fairly specialized. The parts tend to only work for that one set, whereas the older sets had pretty simple pieces. I didn't actually go in the store - it was too full - I just admired the statues. Some of my models only lasted a short while before I dismantled them to use their parts for other creations. Although, I suppose that did depend on the complexity of the model. But once my Millenium Falcon took it's fall, I scrapped it to use for other parts; looking back on it now, the design for it was really poor, hence why it fell apart so easily. I'm currently in the midst of taking my students on a band trip to Orlando, and today we went to Downtown Disney where we saw, amongst other things, the Lego store. Man, that's a hobby I could sure get into if I had but a little more time and a lot more money. In addition to the geek-tastic Star Wars sets (Tantive IV, anyone? ), they have all kinds of other interesting lines, such as the perfectly-suited Architecture series (Fallingwater FTW), and the I'll-Wait-And-See Prince of Persia series. I would always pull them off with my teeth. I'm too young to have bought most of the 80's/early 90's Legos sets in stores, but I inherited about three 5-gallon buckets worth of Legos from an older cousin (granted, half the Lego-men had mortal wounds drawn on them in red sharpie, but the old school space Legos were so cool). I'm surprised at how many I had of the sets posted here. I must've spend thousands of hours playing with them. - You have 45 minutes to make a car from Legos. You can't use any bricks larger than 4x2 or large specialty pieces. - Each car must have a "driver" lego guy, who has to be able to see out the front of the car. - If your opponent's "driver" is separated from his car, before yours, you win. At the beginning of each round, we went into the kitchen and launched our cars at each other across the linoleum floor. After each round, we gave ourselves a couple of minutes to patch up our cars before going again, but they never lasted more than two or three rounds. It was a glorious mess. I've told my wife multiple times that, if we ever become ludicrously wealthy and build our stupidly large house, I'm going to have a Lego room. A giant room filled with every single set I can get my hands on. I would pretty much live there. Yeah, that worked for me. I would also often get a butter knife to slip in the gap. I have had at least 50% of the sets in this thread. Maybe as much as 75%. We gave away my legos to my cousin a few years back at and that point it filled five and a half garbage bags. Yeah, I loved my Legos. And the good thing is that they'll be headed back to my parents house in a little while as my little brother gets old enough to play with them and I will shamelessly volunteer to show him how it all works. Also, I saw this the other day and almost had a fatal nerdgasm. I now know what I want for my birthday! I don't even like Star Wars that much and I still want that. They do cool stuff like modern takes on the Galaxy Explorer. And here are some ships I made. Star Wars vehicles at a 1 stud per meter scale. The Lego mostly went to my brothers (and is now at my parents' house -- and I'm the only child who still lives in town, so I get to take my kids over and play with it). But even if the Lego lived in my brothers' room, I still did my share of building. It's hard to tell from the image, but that castle contained a ton of bricks. It formed the basis of a lot of kids' brick collections. You always knew which of your friends had that set because their stockpiles of bricks were disproportionately yellow. Legos taught me what a universal joint was. One time one of my parents said they had to get the U-joint on the car replaced, and because of kit 854 I asked if it was in the steering, but they said no, it was the transmission. You're right! Definitely NSFW. I will soon be fired. This guy made a Lego Serenity on Reasonably Clever. Nice, very nice! 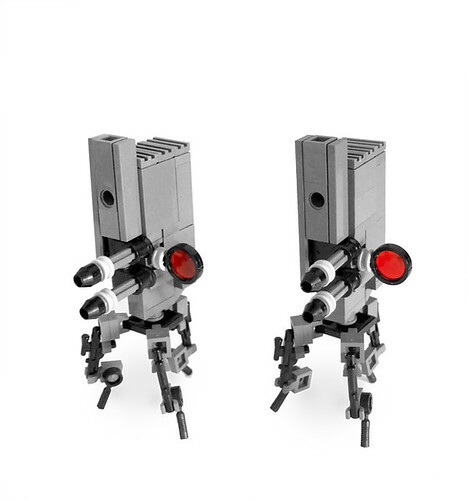 I really love these kinds of Lego models that are made as small as possible (especially mecha). Not having my pieces with me, I used to play around with Lego Digital Designer to try make my own Masamune Shirow-style tanks. Thanks! Try MLCad, it's a homebrew design program. It's a lot more versatile than LDD. I used to make a crazy puzzle with them to torture my sister. Start with a large flat green base. After the maze was created fill in the the remaining portion with a different colour and make them 2 layers high. Remove the path pieeces and build a 3rd layer on top that completely covers the maze. "We're saved! It's the Dong Ship!" I think the coolest thing I ever did was make an entire village that surrounded my LGB train set. Took all Sunday with my sister's help. Anyone have any luck with a lego digital designer program for a 64 bit OS?